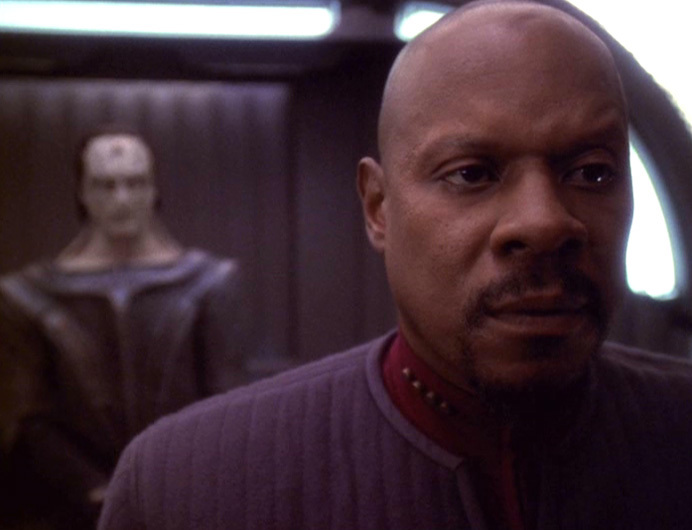 Sisko is on board the U.S.S. Honshu, a ship taking our old buddy Gul Dukat to a hearing regarding his alleged role as a war criminal. Dukat, of course, had a major breakdown when the Federation retook DS9, and he’s not quite all there. Then, the Honshuu is destroyed by some Cardassian ships and Dukat rescues an injured Sisko and lands a shuttle on a desolate planet — where all they can really do is talk and wait to be rescued. Dukat — who’s hallucinating the entire time — wants Sisko’s approval or at least forgiveness so much that he makes it look like he’s transmitting a distress signal, when he’s really not. Sisko discovers this, and Dukat attacks him. A fed up Sisko finally agrees to talk out Dukat’s past — and gets Dukat to admit that he wanted to kill the Bajorans all along. Sisko nearly escapes after clubbing a distracted Dukat, but Dukat leaves in the shuttle (which apparently was working all along) and tells Sisko he intends to seek revenge on the Bajorans. Dukat then lets a rescue party led by Worf on the Defiant Sisko’s whereabouts. In the Defiant’s sickbay, Sisko tells Dax that he’s sure now that Dukat is “pure evil” and that the two will likely face off again. Thunderclap. Dukat’s careening path from ambitious opportunist to crazy psycho is really put in place here, after a pit stop in between in which he was in a mental hospital (which we only learn about in passing). 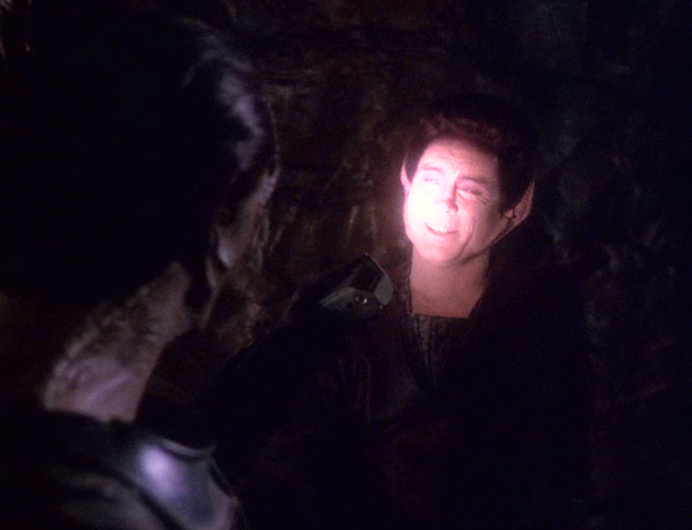 Dukat, of course, becomes DS9’s random element through the end of the series, not truly acting in the Dominion’s best interest but with motives that (somewhat annoyingly) alternate between getting Sisko and letting him go (as he did here) and getting back at the Bajorans and looking for their worship. This, of course, wasn’t the first episode since the Federation retook the station, but it is the first one after “Sacrifice of Angels” that we reviewed. So, as a sort of footnote, this episode is one of many where life on the station sort of has returned to normal. 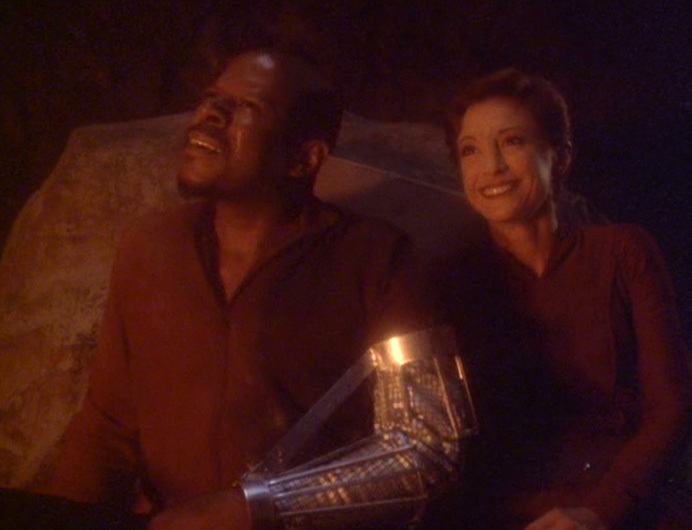 Too often in late DS9, our heroes (or our main characters) seem to be the only people out of dozens or even hundreds who escape after a ship is destroyed. Why the DS9 creators couldn’t have just said that there were 100 survivors or something is beyond me. Also, isn’t it odd that Kira and Odo are apparently getting orders from Starfleet and passing them on to Worf and the other Starfleet folks? After the Honshu is destroyed, Kira and Odo are talking in Sisko’s office and then tell Worf, Dax, Bashir and O’Brien that they only have a brief window to find Sisko before starting on another mission. I could probably swallow if Kira on her own was getting the briefing, but Odo? What an odd choice. In the future, we make everything shiny, including casts. Because… because it’s more futuristic! “Waltz” is, of course, classic DS9. It opens up the deep canvas of the show’s history with great acting and dialog. Avery Brooks and Marc Alaimo bring their absolute A games as actors who clearly got to know each other’s rhythms over the course of several seasons. Words only can’t really do justice to some of the scenes in the cave. We learn about Starfleet’s dark underbelly in one of DS9’s most controversial episodes.